Arterie is an innovative inter-disciplinary model of art in healthcare practice, specifically designed to improve outcomes for Chris O’Brien Lifehouse patients, families, carers and staff by easing the side effects of cancer and its treatment such as stress, pain, fatigue, isolation and depression. Arterie participates in a way that fits with the patient’s treatment – it is non-invasive, inclusive and supportive. The Arterie program was founded and is facilitated by Amanda Solomon and Deborah Burdett and is delivered by a dedicated group of ‘Arterists’. All Arterie team members are qualified practicing artists who are committed to enhancing the Lifehouse experience for patients, families, carers, visitors and staff members through a variety of art engagements. We need your help knitting and crocheting beanies to keep our patients warm year-round. We ask that you knit or crochet a summer beanie using pure cotton, or a winter beanie with pure wool, with a loose stitch in any colour. Hundreds of beanies have been donated to patients who have lost their hair after treatment. Carterie is a mobile art studio delivered to treatment and waiting spaces in Lifehouse. 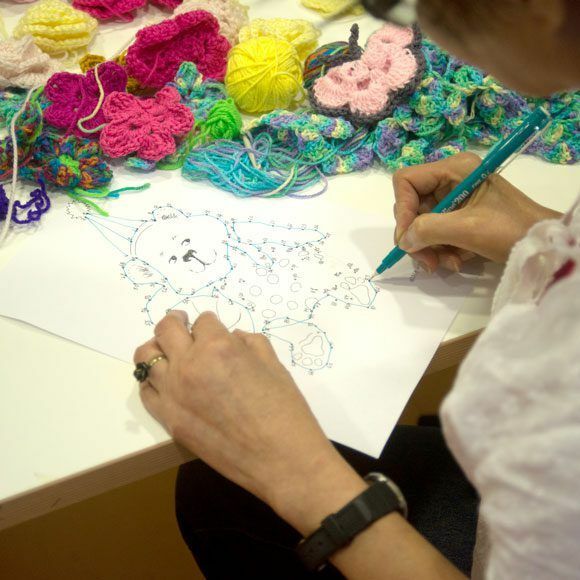 Each Carterie is delivered by an Arterist and offers a range of diverse arts and craft activities for patients and visitors to enjoy. The activities have been specifically designed to accommodate all skill levels as well as varied levels of fatigue, physical limitations and concentration. Each activity is individually packaged with written instructions which can be undertaken with the guidance of an Arterie member, on your own or may be taken home. All activities are designed as ‘bites’ that are collected and joined as a collaborative work to be on display in Lifehouse. Arterie’s Artist-in-Residence (AIR) Program offers a three-week residency to a different practicing artist each month. The artist demonstrates in the main foyer of Lifehouse, which adds a performance element to the artwork for all Lifehouse patients, visitors and staff. Works vary according to individual practice, may be ephemeral and are often site specific. In conjunction with the AIR’s major work, a complementary activity may be offered to patients from Carterie, or on a communal foyer table. Free group workshops for up to 20 participants are held monthly in the LivingRoom Group Room. Running for two to three hours, the workshops are designed to include a variety of mediums and cater to all skill and age levels. These workshops offer the time and opportunity to work with wet mediums such as painting, felting and ceramics. The Arterie Public Lecture Series is designed to educate, inform and showcase the overlap between art and wellbeing. The monthly series includes speakers from the worlds of art and health including gallery and museum curators, designers, architects, academics, health professionals and artists.